The University of North Carolina at Greensboro was chartered on 18 Feb. 1891 as the North Carolina State Normal and Industrial School with an initial appropriation of $10,000. It was the work largely of Charles Duncan McIver and Edwin A. Alderman, who had been advocating for years for a state normal school for teachers, particularly women, who comprised most of the public school teachers. Several localities desired the school, but Greensboro won the bidding war, pledging $30,000 in additional funds. The school became a college in 1897, and baccalaureate degrees followed in 1903. The teacher training curriculum was accompanied from the beginning by training in domestic science and commercial subjects. In time, the liberal arts assumed prominence alongside expanded offerings in education, home economics, and music. 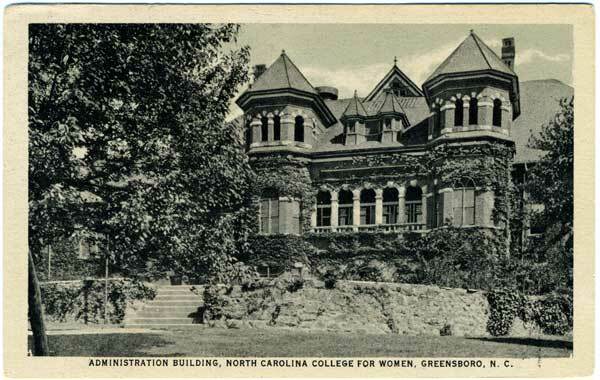 In 1919 the institution was renamed the North Carolina College for Women, and in 1931, when it joined the University of North Carolina at Chapel Hill and North Carolina State College in Raleigh in the new consolidated University of North Carolina System, it became the Woman's College of the University of North Carolina. So it remained until 1963, when it emerged as the University of North Carolina at Greensboro (UNCG) with coeducation and a broader educational mission. The initial site in 1891 was a ten-acre tract on what was then the western edge of Greensboro. The campus grew to nearly 200 acres surrounded by urban, residential neighborhoods. The student body numbered 223 by the end of the first year-as many as the campus and neighboring private homes could accommodate. By the early 2000s, the university had more than 13,000 students. The nature of the student body changed vastly over the years. The most obvious changes were racial desegregation, which began with the admission of the first two black students in 1956, and coeducation, which began officially in 1963. Fully as important, UNCG has become a commuter as well as a residential campus, with more than half of the students living in the greater Greensboro area. Although postgraduate training began early in the institution's history, UNCG granted its first doctorate in 1963. The earliest doctoral programs were in professional areas such as education, home economics, and physical education, areas in which the Woman's College had already established strong graduate programs. Doctoral programs in English and psychology soon followed. The modern university offers master's degrees in 68 fields and doctorates in 14. Its arts programs are nationally known. Weatherspoon Art Museum houses what is considered to be the most outstanding permanent collection of contemporary art in the Southeast. UNCG is also one of only six higher educational institutions in North Carolina approved to have a Phi Beta Kappa chapter. Elisabeth Ann Bowles, A Good Beginning: The First Four Decades of the University of North Carolina at Greensboro (1967). Allen W. Trelease, Changing Assignments: A Pictorial History of the University of North Carolina at Greensboro (1991). Search Results for 'North Carolina College for Women' in North Carolina Digital Collections. North Carolina College for Women. Image courtesy of UNC Libraries.Available from http://www.lib.unc.edu/ncc/ref/nchistory/feb2009/index.html (accessed November 19, 2012). 1 January 2006 | Trelease, Allen W.